The Seay Mansion is a historical monument built upon dreams by Abraham Jefferson Seay in hopes that Kingfisher would be the new capitol of Oklahoma Territory. 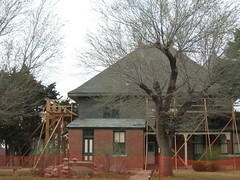 Governor Seay served as second Territorial Governor of Oklahoma from 1892 to 1893, built the three story mansion story mansion named "Horizon Hill" for approximately $11,000.00 on fifteen acres of land purchased for $637.50, just outside of Kingfisher, OT. The mansion was completed in March of 1892 to host dignitaries present present for the opening of the Cheyenne and Arapaho Land Run. Tuesday through Saturday -- 9 a.m. to 5 p.m.
Sunday -- 1 p.m. to 5 p.m.